Origin and Habitat: Cycas seemannii occurs on several of the Fijian Islands, on Vanuatu, the Tonga Island group and New Caledonia (western Pacific south of about 12° S). Altitude range: Recorded from sea level up to 600 metres above sea level. Habitat and Ecology: This species is fairly widespread on stabilized coastal dunes developed on coral sand or coral limestone, less commonly on basaltic loams and other heavier soil types, but extending to various substrates on continental islands (except New Caledonia, where restricted to coastal sites, possibly as a result of more recent introduction there). It is confined principally to drier areas on rocky open slopes and ridges. It yields buoyant seeds that are readily distributed by ocean currents, and are generally found growing along the coast. Major Threat(s): It is considered vulnerable as its habitat has been continually disturbed by agricultural ventures. A great deal of its habitat has been replaced by agriculture, yet, many plants are still encountered in patches of undisturbed forest. Decline of populations is expected to continue. Cycas circinalis subs. seemannii (A.Br.) J.Schust. Cycas rumphii f. seemannii (A.Br.) Kaneh. 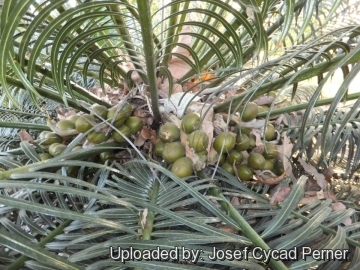 Description: Cycas seemannii (Seemann's sago) is a tall, erect, tree-like and usually unbranched cycad species mimicking the look of short palm trees. Its long leaves (fronds) are deep glossy green and feathery. 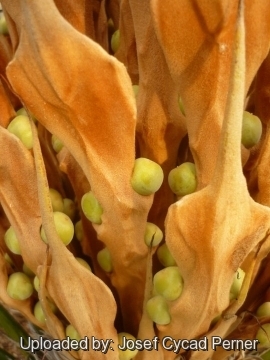 Fronds radiate from a central point at the top of a woody trunk-like stem. 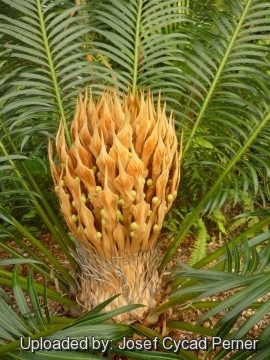 Newly emerging fronds are soft and flexible, and shed orange-tan fuzz as they mature deeper green and stiff. After pollination via the wind, orange-brown seeds develop and are shed to the ground. It was once classified as Cycas circinalis subsp. seemannii) or Cycas rumphii f. seemannii, but is now distinct from all others species. Derivation of specific name: The specific name honours the German naturalist and publisher Berthold Carl Seemann (1825-1871), collector of the type, who trained as a botanical collector at Kew and left most of his collections at Kew. Distinguishing features: Distinguished by the relatively narrow leaflets with some but interrupted laminar hypodermis, the relatively short, usually spine-free petiole, the triangular megasporophyll apex with a distinct terminal spine and 18-30 distinct lateral spines 2-8 mm long. Plants from Vanuatu are generally more robust with broader leaflets, possibly due to genetic admixture from Cycas bougainvilleana to the north. More clearly intermediate forms occur in the Solomon Islands. Stems: Arborescent, to 4(-10) m tall, 10-20 cm diameter at narrowest point. Leaves (fronds): Deep green, semiglossy, 150-200 cm long, flat (not keeled) in section (opposing leaflets inserted at 180° on rachis), with 150-230 leaflets, with white and orange tomentum shedding as leaf expands; rachis usually terminated by paired leaflets. Petiole 28-39 cm long (16-22% of total leaf), petiole glabrous, unarmed (sometimes spinescent for up to 20). Basal leaflets not gradually reducing to spines, 90-150 mm long. Median leaflets simple, strongly discolorous, 180-290 mm long, 8-15 mm wide, inserted at 45-70° to rachis, decurrent for 4-10 mm, narrowed to 4-7 mm at base (to 33-45% of maximum width), 12-21 mm apart on rachis; median leaflets section flat; margins slightly recurved (sometimes undulate); apex acute, not spinescent; midrib flat above, raised below. In tropical climes, flushes of new growth can occur at any time but are more likely during the warm wet season. 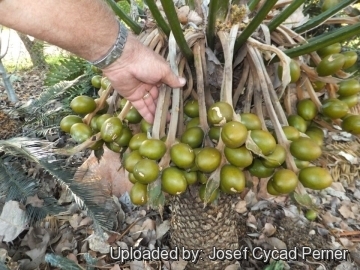 Cataphylls: The cataphylls (Modified leaf, much reduced and thickened, serving to protect the apical meristem in cycads produced in flushes preceding the emergence of cones or leaves.) are narrowly triangular, soft, pilose, persistent. Male cones: Fusiform, orange to brown (pale), 35-50 cm long, 12-15 cm diameter, microsporophyll lamina firm, dorsiventrally thickened, 30 mm long, 15 mm wide, fertile zone 25 mm long, sterile apex 5 mm long, level, apical spine rudimentary or absent, sharply upturned, 0-5 mm long. 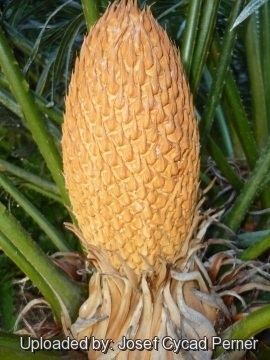 Megasporophylls: Like other Cycas species, the female plants do not bear cones; instead they carry ovules and seeds on large, white-tomentose and yellow-tomentose megasporophylls which are 25-35 cm long; ovules 4-8, glabrous; lamina ovate to lanceolate, 50-85 mm long, 20-40 mm wide, regularly dentate, with 20-30 pungent lateral spines 2.5-8 mm long, 1-2 mm wide, apical spine distinct from lateral spines, 10-20 mm long. Seeds: Flattened-ovoid, 45-60 mm long, 40-50 mm wide; sarcotesta orange-brown, not pruinose to slightly pruinose, 4-5 mm thick; fibrous layer absent; sclerotesta apically crested. Spongy endocarp present. Cycas neocaledonica Linden: ( = Cycas seemannii) This is the geographical or morphological form from New Caledonia Islands. Distribution: New Caledonia (western Pacific south of about 12° S). Cycas seemannii A.Br. : has narrow leaflets with short, usually spine-free petiole. Megasporophyll triangular with a long terminal spine and up to 18-30 short lateral spines. Distribution: Fijian Islands, on Vanuatu, the Tonga Island group and New Caledonia. 1) Hill, K.D. 2010. Cycas seemannii. The IUCN Red List of Threatened Species. Version 2014.3. <www.iucnredlist.org>. Downloaded on 17 November 2014. 5) The Cycad Pages “Cycas seemannii” Royal Botanic Gardens Sydney Written and maintained by Ken Hill 1998-2010 Maintained by Leonie Stanberg and Dennis Stevenson 2010-2012 >http://plantnet.rbgsyd.nsw.gov.au> Web. 13 Nov. 2014. 9) Jones, D.L. “Cycads of the World.” 2nd edn. Reed, Sydney. 2002. 11) Walters, T. and Osborne, R. “Cycad Classification Concepts and Recommendations.” CABI Publishing, Wallingford UK. 2004. 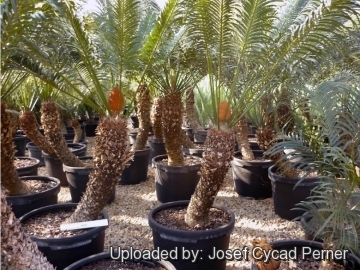 Cultivation and Propagation: Seemann's sago (Cycas seemannii) is suited to tropical regions which have a seasonally dry climate both on the seaside or inland. It is easy to grow, tolerating dry periods. Seemann's sago is a striking tropical accent plant ideal for sunny borders and large containers. It is often the focal point in a large yard. It is becoming more and more common and turning out to be a great landscape plant. 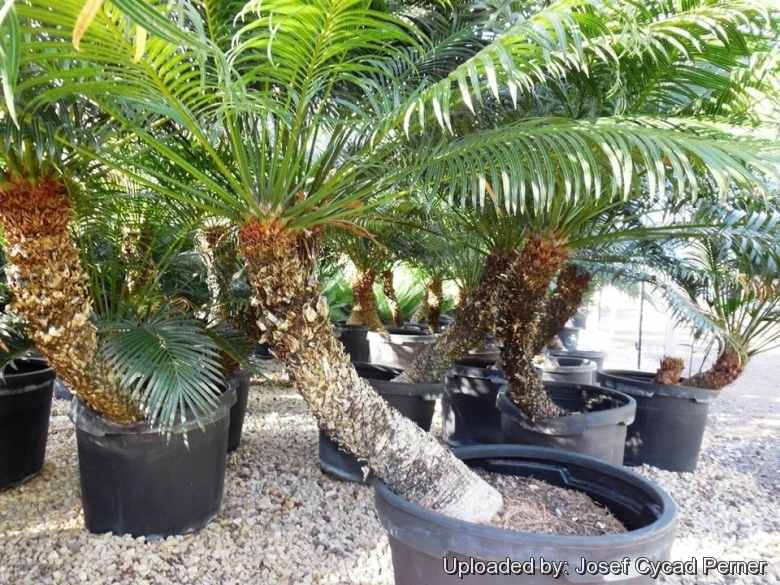 Growth rate: It is a robust, fast-growing species, one of the fastest and easiest Cycas species. Because of its growth habit, fertilize only when terminal bud begins to swell, indicating the start of the annual growth cycle. Exposure: Plant Seemann's sago in full to partial sun. Aerosol salt tolerance: It is very tolerant of extreme coastal and beach exposure, as well as salt spray. 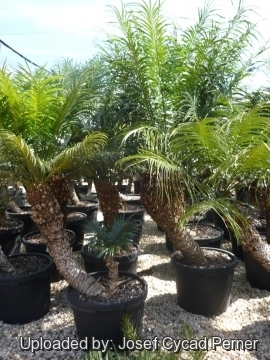 This is one of the most salt tolerant cycads! Use: Landscape as cultivated perennial in warm, coastal areas; House-plant or interior-scape, as container plant in cool areas, as well very well suited to bonsai culture. 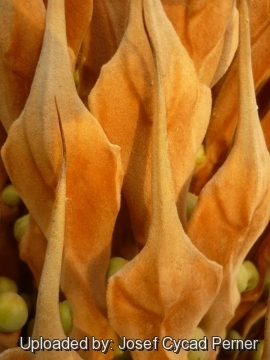 Seeds are ground and made into a type of bread and the fresh male cones are said to be edible.